The New Nissan Qashqai integrates the latest technology with ergonomic design to give you a drive matched in power and responsive safety technology. When you drive a Nissan Qashqai along the street of Cape Town or a trail road in the heart of the Winelands, you will experience a vehicle that marries comfort with balanced control. The Qashqai has been the number one vehicle in South Africa for more than 10 years and still owns the off-road and urban streets. 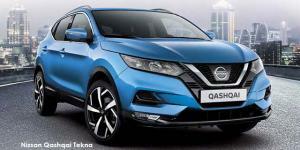 Nissan always designs their cars around the consumer and the 2017 Qashqai SUV is no exception. The Nissan Qashqai is as impressive inside as it is outside, with added interior and exterior design and accessories to take the compact SUV ahead of its class. The exterior design elements include sleek LED headlights, aggressive grille styling and a rear spoiler. For select models, you get impressive sporty 18-inch alloys, brushed metal roof railings, tinted windows, and much more! 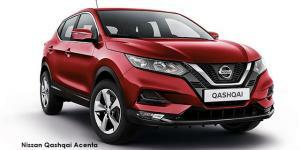 All these additions give the Nissan Qashqai a premium yet primal presence on and off the road. The interior design includes refined sophistication and comfort that enhances the drivability and comfort. Scientifically engineered Quattro-layered interior insulation, optimises the acoustic isolation of the engine and exterior driving noises – to give you a quieter more refined drive. NissanConnect and navigation systems are just some of the additional extras that you can get in the range of Nissan Qashqai’s available from William Simpson. Get a 360-dgeree view of your surroundings with the Around View Monitoring system. The responsive yet fuel efficient Xtronic CVT transmission delivers power with perfect balance to the wheels to give you a comfortable and smooth driving experience. The chassis is built to allow for optimal control around corners and stability at higher speeds. You can’t get a better result than the 5-star EURO NCAP safety rating, which was awarded to the New Nissan Qashqai for its driver and passenger protection. All Qashqai models come standard with 6-airbags, ISOFIX child anchors, traction control, ABS, Vehicle Dynamic Control (VDC) and active headrest protection by moving forward during an accident to reduce whiplash in the driver and front passenger. Love what you see? 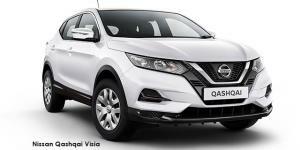 Check out our range of Nissan Qashqai’s or contact us today to chat about your business or personal vehicle needs and let our highly-trained sales staff at William Simpson can assist you.